In computer-speak, the mind that runs your Raspberry Pi is called an operating system (OS for short). Operating systems are like a computer manager; they run your computer for you. When you tell your computer to do something, it’s the OS that listens to your commands, makes them happen, and shows you what happens after you give them. The OS includes the features that make the keyboard, mouse, screen, and storage work. It also connects your computer to the Internet and exchanges information with it. The bad news for Raspberry Pi fans is that you can’t set up a Pi with Windows, OS X, iOS, or Android. There is a version of Android for the Pi, but it doesn’t work very well. So just pretend there isn’t. Instead of Windows or OS X, you can run a free OS called Linux on your Pi. Linux is unusual because it’s designed for people who like to tinker with computers. You can change any feature of Linux to make it work the way you want. Your Pi uses an operating system called Raspbian. Raspbian is a special raspberry-flavored remix of a popular version of Linux called Debian. The Raspbian desktop, shown in the following figure, looks a bit like the desktop that appeared in older versions of Windows, before Windows 8 added bright tiles. Raspbian also looks a bit like the OS X desktop, but without the flat gray highlights and the stylish lettering. 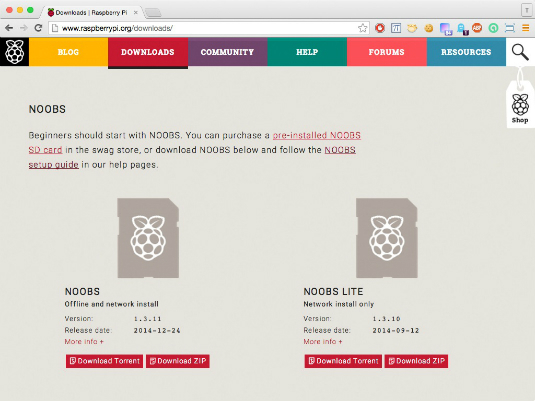 If you’ve used a desktop on a Mac or PC, Raspbian will feel familiar. There are some differences, but one desktop is a lot like another desktop, so you won’t have to learn a whole lot of new stuff. Debian is popular because it works well for general computing. It doesn’t include all the latest tinkering that happens around Linux, so it doesn’t break as often as some versions of Linux do, but it includes all the usual free Linux tools and software. The Raspberry Pi version also includes some free games.